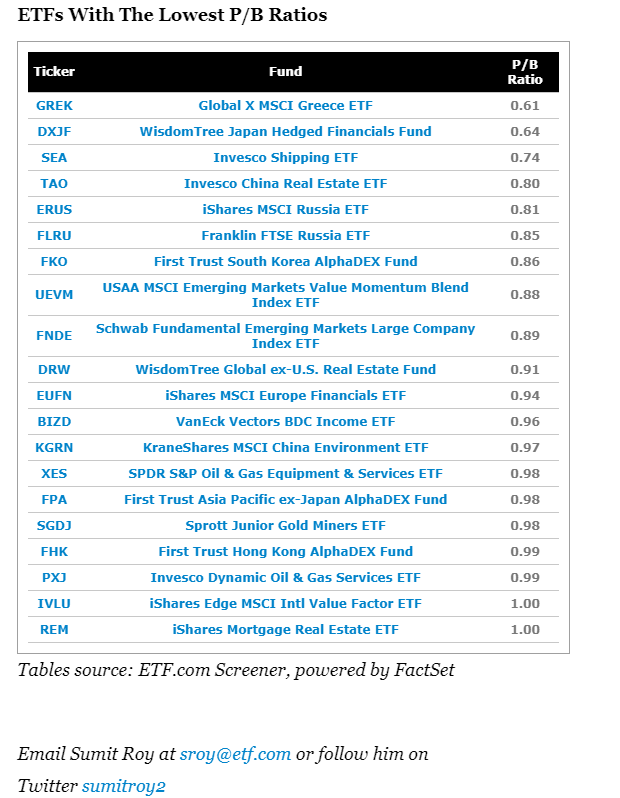 Instead, most of the bargains are found in ETFs that focus on equities outside the U.S. Of the 20 cheapest funds by valuation, the vast majority target international equities, and emerging market stocks in particular. 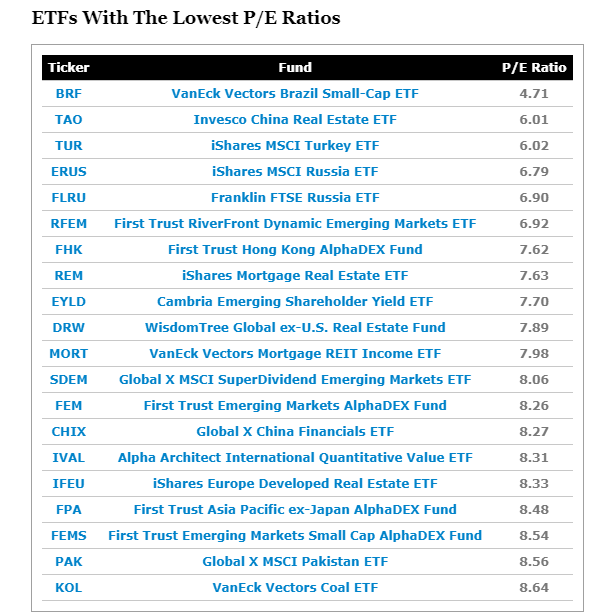 Of course, an ETF with a low P/E ratio doesn’t necessarily mean it’s a great investment. It simply means most of the stocks in the fund are trading at low prices compared to their recent earnings. It’s a good starting point for value investors, but it’s just the first step in a more comprehensive due diligence process. 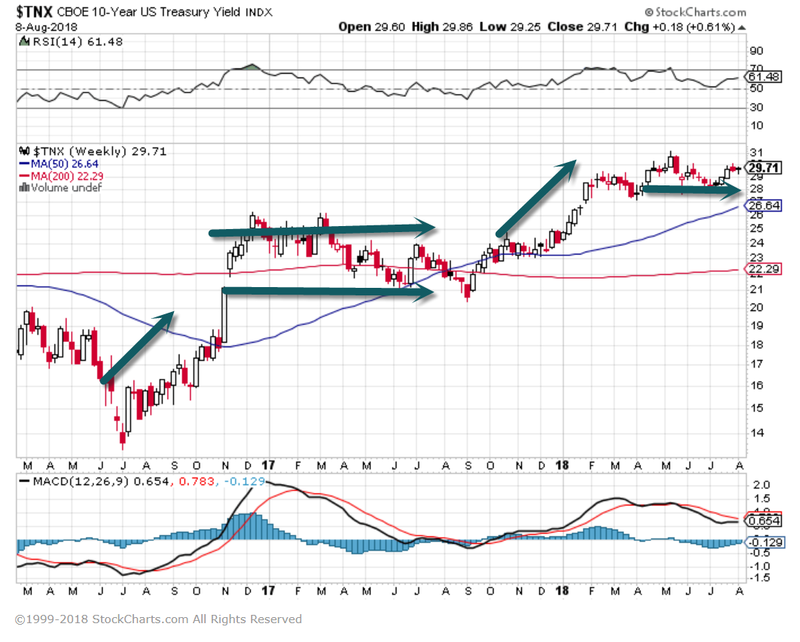 3.10 Year Treasury Yield Index…Spiked end 2016..Sideways 9 months…Spiked end 2017…sideways 7 months…..Rest of Year??? 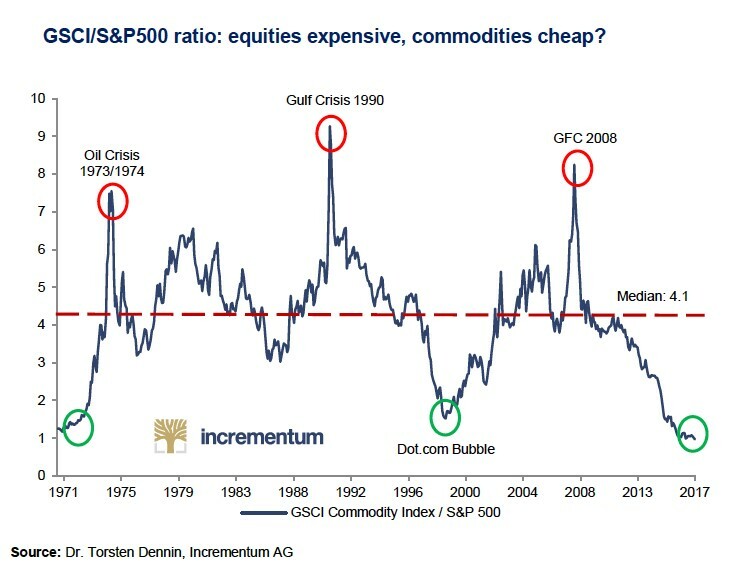 5.Ratio of Commodities to S&P 500….Cheapest in History? 6.Sonos IPO Affected by Trade War and Recent Hardware Offerings. Sonos’ IPO last week showed a promising forecast for the home audio system company, with shares eventually level ling out to about $19. The company is now valued at $1.5 billion , but investors are concerned about Sonos’ long-term endurance as it gravitates toward producing products with longer shelf lives, which result in longer replacement cycles. 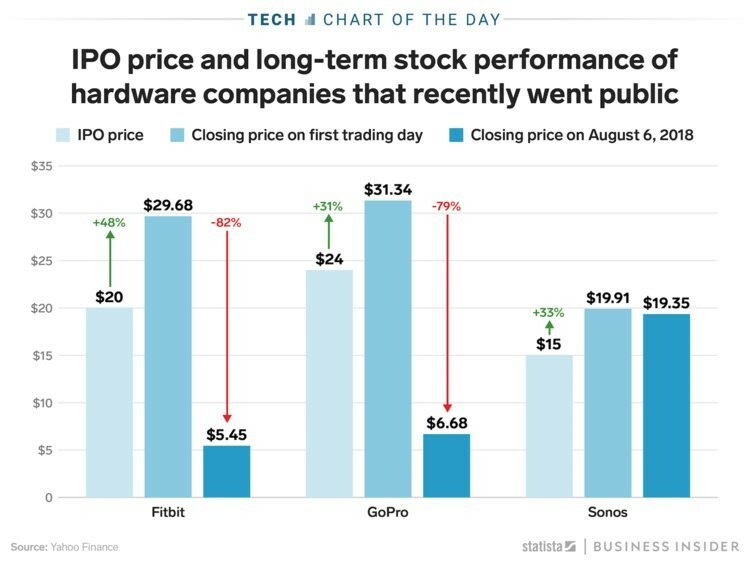 As this chart from Statista shows, the track record of other consumer hardware companies like Fitbit and GoPro is a trajectory that Sonos should avoid. Both companies saw encouraging IPO results before declining sales eventually caused share prices to drop nearly 80%. 7. 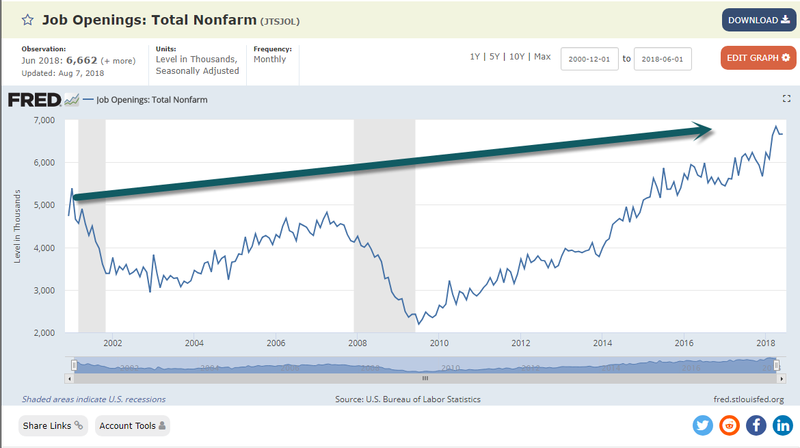 6.7M Job Openings Unreal….17 Year High. 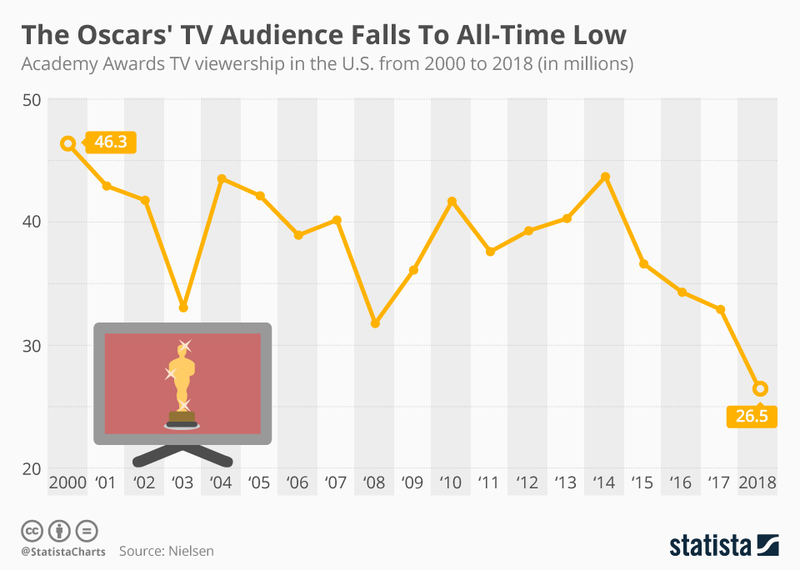 8.Oscar Audience Down 40% Since 2000. So why switch things up? This year’s Oscars audience was 26.5 million…second only to the Super Bowl as the most-watched TV broadcast in the U.S. The bad news? That was the least-watched Oscars telecast since they’ve been keeping track. Howard Marks (Trades, Portfolio) of Oaktree Capital was just interviewed at the 2018 Delivering Alpha conference. Marks (Trades, Portfolio) is the author of :The Most Important Thing” and the upcoming “Mastering the Market Cycle.” He has been the chairman of Oaktree Capital Management LP since the inception of Oaktree in 1995. His public memos are famous in the investing world and Warren Buffett famously said they are the first thing he reads when he finds them in the mail. I read everything Marks puts out and try to listen closely when he speaks somewhere. There are a few key takeaways from this appearance although his message remains nuanced. It seems to me there is some of this dynamic going on. Retail is an industry that’s been proclaimed dead. 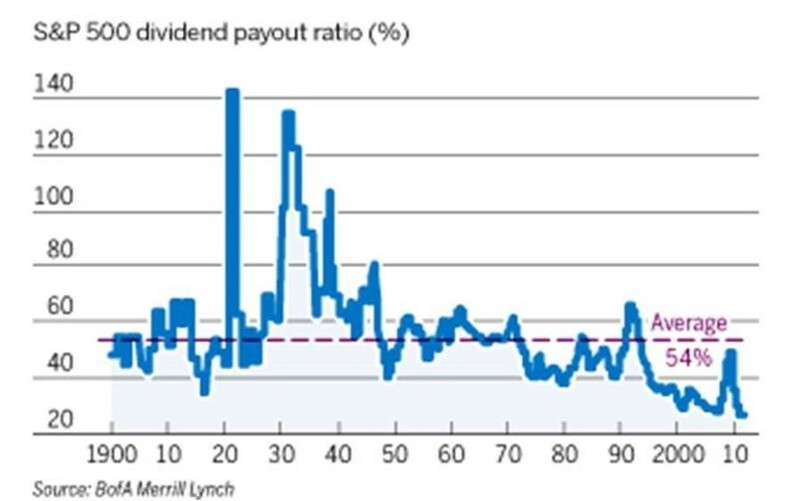 We’ve gotten used to the current super low interest rates which have favored certain business models relying on future cash flows (that may or may not appear) and highly levered ones. Interestingly, both tend to be avoided by value investors. In the 50 years Marks has followed markets he observed that people tend to come up in the later stages with rationalizations why cyclicality no longer applies. According to Marks the current key question is: Do you want to push your chips out or do you want to take a few off? Marks said eight months ago before the tax bill passed that the market was actually less attractive. The forward price-earnings ratios went down from meaningfully overpriced to about average. Even though earnings projections have risen by double digits, the market is only up a few percent. Meanwhile there are a lot of potential negatives out there, Europe and trade wars for example. 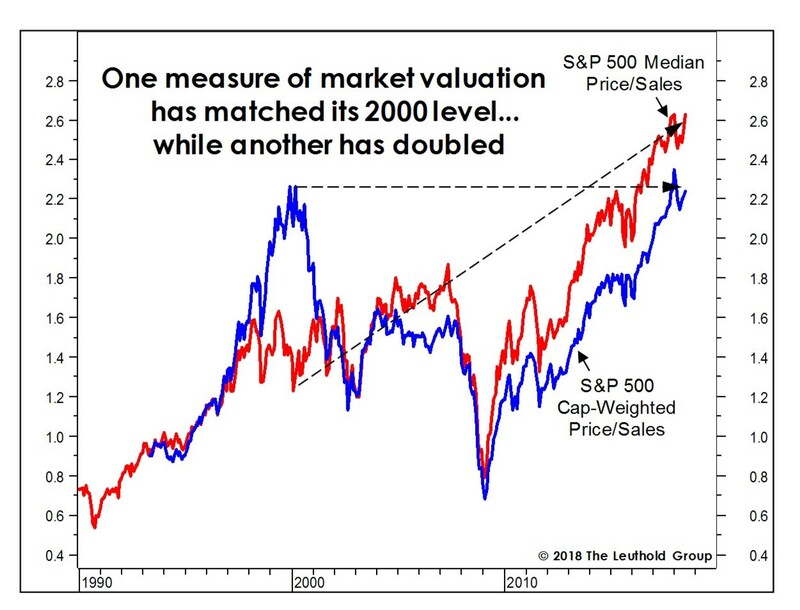 Investors underestimate the discounting mechanism of the markets and expect that when things are good (as they currently are) that means the market will run up. What cracks the bull market? He says his money is always on the fourth. If he can’t bet on a surprise, rising interest rates seem most threatening. We have artificial low rates and have had them for nine or 10 years. It is unclear how the unwind will go. The yield curve is something people are talking about already. That’s the curve you’ll observe if you draw a line through treasury interest rates at various maturities, two-year, five-year, 10 year, and so forth. Usually the interest rate rises as you go further out in maturity. When it doesn’t and interest rates on the two-year and the 10-year are the same, you have a flat yield curve. This happpened before almost every recession. However, it signals false positives as well. Another worry of Marks is the national debt. We will add a trillion per year to the national debt. Is there a number that matters? People used to be prudent about national debt, but now there is no prudence, he said. If you want to take away the punchbowl you aren’t getting votes. The Republicans used to play this role, but they voted on the tax bill knowing what it would do. Move forward but with caution. Marks said Oaktree is already a cautious firm and currently more cautious than usual. On a high level Marks suggests this isn’t a great time to try and hit the ball out of the park. Which is something I wholeheartedly agree with. Specific markets Marks likes are emerging market equities, private lending, real estate lending and infrastructure. He jokingly calls everything with a CUSIP overpriced. Disclosure: Author is long Oaktree Capital (NYSE:OAK). 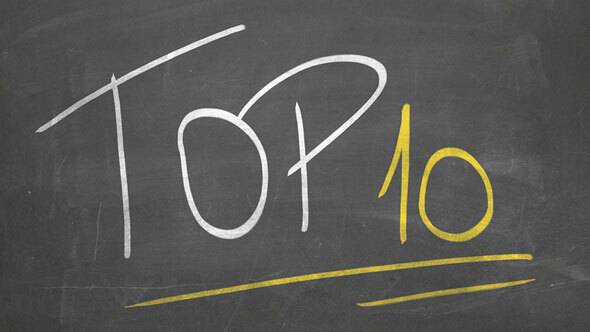 10.What the Hell Are Your Blind Spots? Hold weaker opinions.Recognize that unless you are an expert in a field, there is a good chance that your intuitions or assumptions are flat-out wrong. The simple act of telling yourself (and others) before you speak, “I could be wrong about this,” immediately puts your mind in a place of openness and curiosity. It implies an ability to learn and to have a closer connection to reality. Be realistic. It’s not about removing your faulty psychological reactions. It’s about understanding them so that you can adjust to them. The same way we all have some skills and activities we’re better at than others, we all have emotions we’re better at than others. Some people are bad with happinessbut good at managing their anger. Others are terrible with their anger but relish their happiness. Other people never feel depressed but suffer uncontrollable guilt. Others never feel guilty but struggle with feelings of depression. Where are your strong emotions and weak emotions? Which emotions do you respond poorly to? Where are your biggest biases and judgments coming from? How can you challenge or re-evaluate them?